A year ago the European Union introduced the first package of sectoral sanctions that finally closed the western capital markets for Sberbank, VTB, Gazprombank, Russian Agricultural Bank, and VEB. On July 30 Washington extended sanctions for another 11 individuals and 15 legal entities, mostly from Russia. Vnesheconombank subsidiaries are included in the list. The bank is subject to the sanction of the European Union and the US for over a year. Exactly a year ago the European Union introduced the first package of sectoral sanctions that finally closed the western capital markets for Sberbank, VTB, Gazprombank, Russian Agricultural Bank, and VEB. Over the year the banks learned how to find money at the domestic market and started to look for a place on the Asian market, but they are still not ready for a prolonged isolation, experts say. The introduction of the European sanctions on July 31 last year was not a surprise for banks - at that time similar restrictions from the US were already in force. Nevertheless, for the last 10 years Europe was the traditional market for raising capital for the Russian emitters that were actively registering special purpose entities (SPV) and became familiar with the London stock exchange. In the Western markets Russian banks had recognizable brands, and even started to become familiar with the european retail (Sberbank Europe AG, Sberbank subsidiary and VTB Deutschland, VTB Group subsidiary). Restrictions from the main financial partner for local bankers became more of a moral challenge than commercial. It was necessary to change the whole business paradigm, to look for alternative capital sources. The sanctions issue continues to be extremely painful for banks - Sberbank, VTB, Gazprombank, Russian Agricultural Bank and VEB declined to comment on the annual results of its work to alleviate the impact of sanctions. According to the Cbonds’s data, the largest banks, subjects to sanctions, were even able to reduce the amount of debt load in that year. Redeemable Sberbank debt declined as of July 30, in annual terms by 19% to $13.5 bln, Gazprombank’s - by 28% to $12.31 bln, VEB - by 15% to $17.23 bln. Total debt of VTB and Russian Agricultural Bank fell to $10.51 bln and $15.072 bln, respectively. In ruble terms the amount of debt to maturity showed an increase due to a devaluation of the ruble by 40%. This year the banks do not have to repay not a large volume of the foreign currency debt. Sberbank has to pay 410 mln Swiss francs in the autumn, VTB - 300 bln Swiss francs and 2 bln yuan, Gazprombank - 500 mln Swiss francs and $1 bln, the Russian Agricultural Bank - 450 mln Swiss francs, VEB does not have payments on foreign currency debt in the near future. Russian banks did not have any problems with the repayment of the debt this year. Although formally only the Western currency markets are closed for the five largest Russian banks, due to the global integration of the investment flows the Russian companies can easily find partners in other countries. It will take some time before Sberbank or VTB become brands in Singapore or Hong Kong. However, at the request of the Sberbank Head German Gref, due to sanctions the largest Russian credit organization cannot attract "a penny" adroad. Having lost the ability to raise capital in foreign markets, banks had to settle for the only alternative - to work in Russia, expanding both domestic borrowing program and the share of Russian Central Bank funding. For Sberbank and VTB24, for example, the traditional funding base is deposits of the population. 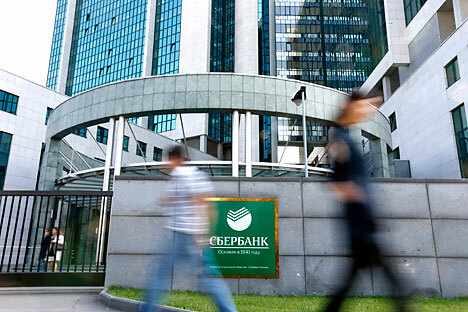 The activity of the banks in the domestic bond market also increased in January, Sberbank announced plans for placement of exchange bonds for 50 bln rubles ($827.86 mln), VTB approved a new program in June, keeping ithe detail a secret. Late last year Gazprombank approved the placement of bonds for 70 bln rubles ($1.16 bln). It is important to understand that the possibilities of the domestic bond market are very limited. The share of the Russian Central Bank in the liabilities of state banks for the year increased by 2.2% for Sberbank, VTB - by 8.3%, the Russian Agricultural Bank - by 5.4% (according to Fitch). Thus, although the reliance on the Central Bank’s funds tends to increase, the critical resources mass cannot be yet estimated. The banks suffered the most from the sanctions indirectly - external constraints hit on the solvency of clients, which led to an increase in the cost of risk and the formation of unprecedented reserves. For example, the cost of VTB’s risk at the end of last year reached 4.6%, having almost more than doubled in a year. However, the bank tightened its credit policy and risk management, which made it possible to reduce the cost of risk to 2.2% by the end of the Q1 of this year. In the Q1 Sberbank increased provision charges 1.5-fold to 115 bln rubles ($1.9 bln). However, the quarterly rate of growth of Sberbank reserves somewhat reduced in quarterly terms. Asian capital markets could become an outlet for Russian banks, but in the long run. The fact is that Asian investment bankers are afraid to work with banks subjects to sanctions because it may mean sanctions for them as well. For example, the US Treasury has done the same thing with the Iranian banks’ counterparties. This year Russian bankers have visited Asia several times, hoping to attract capital: German Gref visited Singapore, Gazprombank held a series of road-shows in the capitals of the Asia-Pacific region. However, there were placements no placements. VTB and Gazprombank have progressed further in the development of Asia that any other bank. VTB is traditionally present in the eastern capital markets; Gazprombank in spring approved the documentation for the bank's exchange bonds in yuan. "The specific plans for banks on placing these bonds have not been yet determined," Gazprombank said. Analysts doubt the possibility of the forced subjugation of Asian markets. "It is unclear whether the biggest banks will be able to place their bonds in the Asian capital markets. There are such capabilities and intentions, but is it really possible? The situation is ambiguous. There is a possibility, but it is small," a source in banking circles said. Analysts fear that the sanctions could be extended indefinitely. The banks could withstand one or two years in the mode of severe restrictions, but a 10-year break in relations would lead to serious consequences. "A further extension of the sectoral sanctions will lead to the isolation of the banks. We will slowly come to a planned economy. It will no longer be a market," TASS’s source from one of the top-30 banks said. According to the source, dependence of banks on the Central Bank and the state will grow as the sanctions are extended.